Wisconsin Aviation welcomes you to the Dodge County Airport! 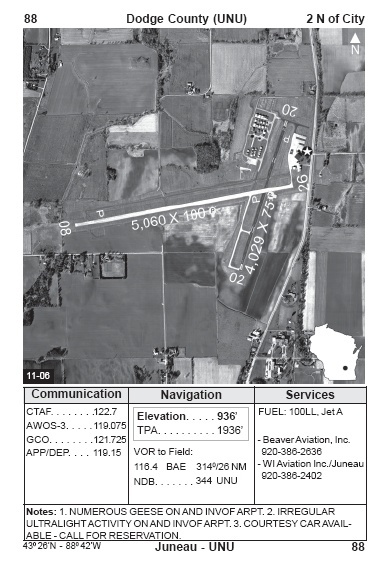 In May 1983, Wisconsin Aviation started FBO operations at the Dodge County Airport, located on State Trunk Highway 26, just north of Juneau, Wisconsin. Our home, the "line shack" terminal, at that time was a small, cozy, wood-burning building that provided a home base for local pilots. It was a friendly repose for pilots and airport "bums" alike. For 14 years, it was rural Dodge County's meeting place for all sorts of aviation enthusiasts. A lot has changed since those infant days. It started with extending runways 8/26 to 5,069 feet. The need was increasing as the aviation community and its faster aircraft required more modern facilities. The rural airport setting had to grow. After the runway extension came the localizer approach for 26, along with its approach lighting. In 1996, our president, Jeff Baum, announced that plans had been made to raze the old, comfy "line shack" with a new terminal/main hangar complex. And so a call went to Westra Construction, Inc., of Waupun, Wisconsin. At 10:00 a.m. on Friday, October 11, 1996, the official groundbreaking took place. Included were members from the Wisconsin Bureau of Aeronautics, Dodge County Highway Commission, Westra Construction, Inc., and Wisconsin Aviation. The plans called for a unique complex with a 6,800-square-foot terminal building and a 13,500-square-foot main hangar as the anchor building. The terminal building itself was framed into the shape of a magnetic north arrowhead.